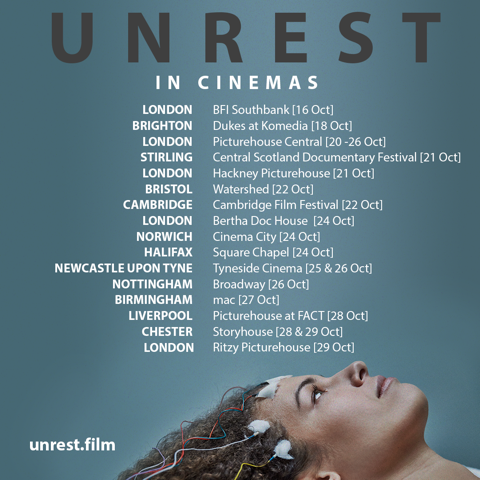 Earlier this year Lyme Disease UK was approached by the Unrest impact team who had been tasked with bringing the film to the UK and getting us involved in promoting their award winning documentary across our various social media platforms. Written & filmed by ME sufferer Jennifer Brea, the film poignantly illustrates how sufferers of any misunderstood and invisible illnesses struggle to be heard and this has also resonated with many sufferers of our Lyme community. 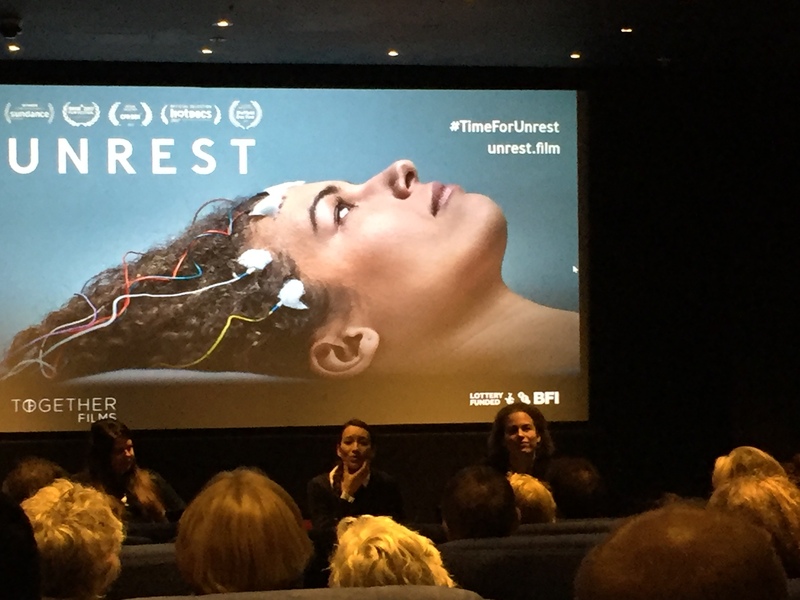 On 19th October, LDUK was invited to attend a preview screening of Unrest before its UK premiere the next day in London. LDUK spokesperson Adam Lomax and his partner Emily Goddard attended the event and the following is his report on what he describes as an “amazing evening”. Thank you so much to Adam, Emily and the Unrest team! 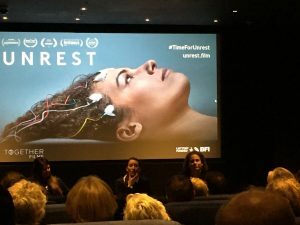 There are still a few official screenings of Unrest before the end of the month so check below to see if any are happening near you or if not, you can host your own and take part in the #TimeforUnrest campaign! Emily is getting involved in the campaign by hosting a screening on 16th November for anyone from London and the Home Counties. The screening will be held in Bloomsbury, North London. Proceeds are going to Jennifer Brea’s charity MEAction, which is fighting for ME equality in healthcare costs. There will also be a raffle and a cash bar where you can purchase drinks and snacks. Click here for event details. “We were invited to an early preview of Unrest, a powerful documentary focused around those suffering with ME/CFS. The Producer, an M.E. sufferer herself, offers you an intimate insight into her world to offer a tangible flavour of the daily crushing fatigue and on-going pain that comes with this, as yet, incurable condition. The event began with a short drinks reception, which was followed by the film itself. 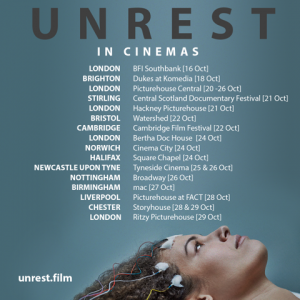 It focuses not only on filmmaker Jennifer Brea’s personal battle with this crippling disease, but also on other sufferers in other parts of the world, filmed from their bedrooms, to show how global this problem really is. The most shocking story was the case of young Karina in Denmark who’d been suffering with severe M.E. She’d been forcibly removed from her home and was institutionalised. It was believed by her consultants that her condition was ‘purely Psychological,’ and that removing her from her loved ones would stop reinforcing her ‘ill behaviour.’ Of course, this route of treatment didn’t work and if anything, she got worse. The film also conveys the very real frustration many sufferers feel at the hands of medical professionals, whose opinions range from confusion to complete dismissal. The film, however, doesn’t just focus on the negative side of going through such a debilitating condition. It also features rays of hope, windows of improvement in the physical capacity of those featured, and even moments of humour. As someone who has suffered similar symptoms, it really struck a chord and was emotional to watch. Following the 90 minute feature, Jennifer Brea came on stage with her husband Omar to do a Q and A, aside the Producer. 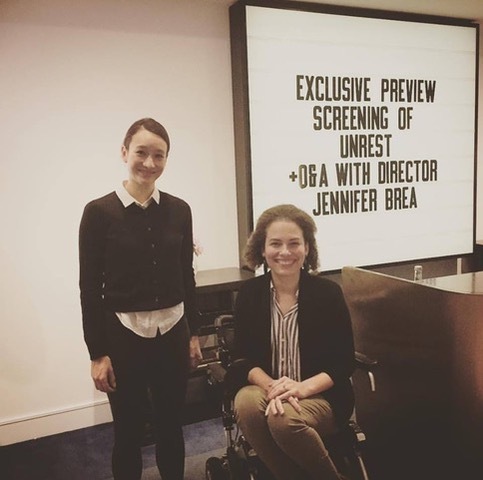 Here the filmmaker discussed the challenges of creating a documentary whilst suffering with chronic illness, as well as looking at treatments which aided her recovery to this point.